Friends of the City of Buffalo Animal Shelter (CBAS) is looking for responsible and committed individuals interested in helping our four-legged friends find forever homes! If you have already received confirmation about an upcoming orientation and need to register, click the Pay Now button below. Your $20 registration fee confirms your spot in your upcoming orientation and needs to be made in advance. This non-refundable fee covers paperwork, processing and your volunteer shirt and nametag once you are cleared to volunteer with our organization. If you change your mind about volunteering or are dismissed as a candidate from the volunteer program, your fee will be repurposed as a general donation to Friends of CBAS. Please do not use this button for general donations or if you have not already received confirmation of the date and time for your orientation! Volunteers are an invaluable resource at the City of Buffalo Animal Shelter. Since the introduction of the volunteer program, the monthly adoption rate has increased by seventy-five percent. Volunteers provide the animals at the City of Buffalo Animal Shelter with daily exercise, training, and socialization. 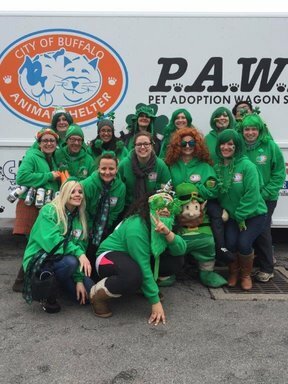 They also participate in a variety of community events such as the St. Patrick's Day Parade, Elmwood Arts Festival, and Winterfest and regular visits to local pet stores to promote the shelter and to find homes for the animals it harbors.